Alaskan Railroad Special Police Chief's Badge #1. Sterling Silver and worn during the 1920's. The Allegheny Valley Railroad (reporting mark AVR) is a class III railroad that operates in Western Pennsylvania, and is owned by Carload Express, Inc.
American Railway Express Company Police Officer Badge. The Railway Express Agency (REA) was a national monopoly set up by the United States federal government in 1917. Rail express services provided small package and parcel transportation using the extant railroad infrastructure much as UPS functions today using the road system. The United States government was concerned about the rapid, safe movement of parcels, money, and goods during World War I and REA was its solution to this problem. REA ceased operations in 1975, when its business model ceased to be viable. The Amtrak Police Department (APD) is a railroad police agency, security organization that acts as the law enforcement arm of Amtrak (the National Railroad Passenger Corporation), the government-owned passenger train system in the United States. It is headquartered at Union Station in Washington, D.C., and has about 428 sworn police officers, most of whom are stationed within the Northeast Corridor, Amtrak's busiest route. 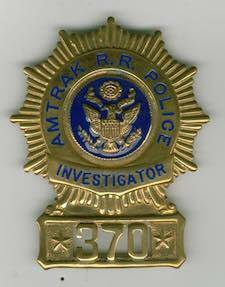 Amtrak Railroad Police Investigator Badge N.E.C. The Atchison, Topeka and Santa Fe Railway (reporting mark ATSF), often referred to as the Santa Fe or AT&SF, was one of the larger railroads in the United States. Chartered in February 1859, the railroad reached the Kansas-Colorado border in 1873 and Pueblo, Colorado, in 1876. Atchison, Topeka and Santa Fe Railway Police Captain Badge. Sterling Silver worn in the 1020's. Atchison, Tepeka and Santa Fe Raiway Police Lieutenant Badge. Courtesy of Southern Pacific Railroad Special Agent Jackson. Bessemer and Lake Erie Railroad #16 Badge. Bessemer and Lake Erie Railroad Police Badge #22. Circa 1920's from Pensylvania. Baltimore and Ohio Railroad Police Captain's Badge. Group of Baltimore and Ohio Railroad Police Investigator Badges all with US Capital center piece. Boston and Main Railroad Police Lieutenant Badge. Burlington Northern Railroad Police Badge with State of North Dakota seal. 1995 Chief of Police and Assistant Vice President, Burlington Northern and Santa Fe Railway Police Department. Bat Masterson was the first Chief of Police of the Santa Fe and Pat Carter was the last. Canadian National Railroad Constable Belt Badge. Current since 1998 with new CN police Log. Canadian National Railroad PoliceDetective Belt Badge. Current since 2005 with the creation of the Special Branch Service. 1940-1960 Canadian National Railroad Police Constable breast badge. 1930 Canadian National Railroad Police pocket ID Badge. Canadian National Railway Police Badge 499 used by Railway Police used between 1923 to 1930. Canadian National Railway Police Badge 617 used by Railway Police used between 1923 to 1930. Old Canadian Northern Railway Police Badge. Canadian Pacific Railroad Special Police Badge. Very rare from circa 1880's. Canadian Pacific Railway Department of Investigations Constable #104. 1970's era. Canadian Pacific Railway Police Badge #345. 1980' era. Canadian Pacific Railway Police Badge #180. 2010 Canadian Pacific Railway Police Constable Badge. 1990's Canadian Pacific Railway Police Service Badge. 2001 t0 2009 Canadian Pacific Railway Badge wit#1881. The Central Railroad of New Jersey, also known as the Jersey Central or Jersey Central Lines (reporting markCNJ), was a Class I railroad with origins in the 1830s. Central Vermont Railway Investigator Badge. Chessie System Railroad Police Badge #56. Badges that belonged to Don Adams who was the first, last, and only Superintendent that the Chessie System Railroad Police Department had in the Chicago area before the Chessie System became the CSX Transportation Company. Don Adams actually wore the Captain's badge and the Superintendent badge. Chicago and Alton Railroad Labor Agent William Martin Badge. He worked as a strike breaker in the early 1900's for the Chicago and Alton Railroad. Chicago, Milwaukee, St. Paul and Pacific Railroad Police Detective Badge. Group of old Pie Badges. Chicago Special Police Patrolman Badge #X293. Chicago, Milwaukee, St. Paul and Pacific Railroad Detective Badge. Current belt badge worn by CSX Railroad Special Agents. CSX Railroad Special Agent Badge worn by Lt. Jim Fisher at his retirement in 2003. Jim also worked as a Railroad Special Agent for the Seaboard Coast Line Railroad and the Atlantic Coast Line Railroad. CSX Railroad Police Retired Badge. CSX Transportation Railroad Police Hat Piece. CSX Transportation Railroad Police Badge. CSX Railroad Police Rapid Response Team challenge coin. CSX Railroad Police Professionalism Safety Trust challenge coin. CSX Railroad Police Excellence In Safety and Service challenge coin. CSX Hazardous Material Incident Management Team challenge coin. Delaware and Hudson Railroad Police Captain's Badge. Denver & Rio Grande Railroad Shop Watchman badge from the 1940's. Denver & Rio Grand Railroad Special Agent Badge #15 and worn in the 1940's. Denver & Rio Grande Railroad Assistant Special Agent Badge #3 retired and worn in the 1940's. Denver & Rio Grande Railroad Special Agent Badge #22 issued in the 1980's and wornbefore the Southern Pacific Railroad merger. Denver & Rio Grande Railroad Police Badge with initials H.S.F. in early nickel and worn duringthe 1930's. Denver & Rio Grande Railroad Special Agent Badge #1265 belonging to G. B. Leonard and worn during the 1950's and 1960's. This Denver and Rio Grande Bridge Guard U.S.R.A. Badge is from World War I when the U.S. Railroad Administration took over the railroads to keep them from striking. Denver and Rio Grande Detective Badge. Detroit and Toledo Shore Line Railroad Police Badge #13. Elgin, Joliet and Eastern Railway Police. Elgin, Joliet and Eastern Railway Police Captain Badge. E.G. Fulcher Erie Railroad Police Sargent Badge. Erie Railroad Police Retired Badge. Great Northern Railroad Special Agent Chief's Badge belonging to Chief Alton G. Ray with the face of GN President Louis Hill in center. This badge is made from 14k gold. Great Northern Railroad Police Special Agent Badge with name Wm. Pelozzi. Great Northern Railway Special Police Badge #12. Great Northern Railway Special Police Badge. Grand Trunk Railway Police Badge. Grand Trunk Railroad Police Sergeant Badge. Grand Trunk Railroad Police Lieutenant Badge. Illinois Central Railroad Police Badge #106 with State of Illinois center piece. Courtesy of Charlie Soukup "Chuck the Cop"